We organize the Client & Partner Sneak Preview to connect the 10 NFC & Contactless Interactions startups with potential clients or partners, to improve their proposition in this program. 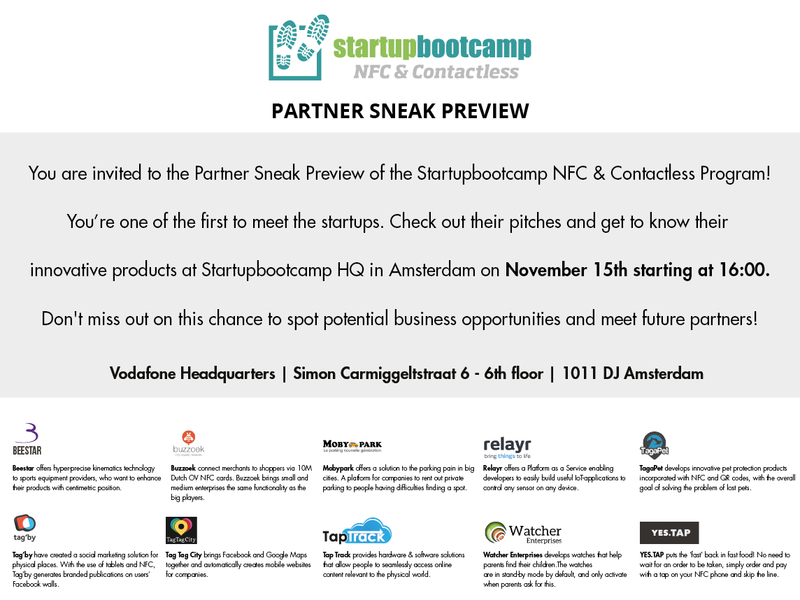 Friday the 15th of November Startupbootcamp Amsterdam NFC & Contactless is organizing a Client & Partner Sneak Preview. Potential business partners for the startups are very welcome to join this session! We organize the Client & Partner Sneak Preview to connect the 10 NFC & Contactless Interactions startups with potential clients or partners, to improve their proposition in this program. During the Client & Partner Sneak Preview the startups will pitch their company and there will be a short Q&A after every pitch. The guests will have the possibility to talk to the startups and to Patrick de Zeeuw and Ruud Hendriks, co-founders of Startupbootcamp Amsterdam and Startupbootcamp Global.